Serve the margarita in a beautiful Mexican cup like this one. This drink of Mexican origin is as famous as uncertain its origin. Many are the legends that try to explain its origin and the name of this famous cocktail. One of the most popular is situated in the year of 1948 in Acapulco, where a young American of the high society named Margarita Sames celebrated a party with famous guests. The hostess, with the intention of cheering up the party came up with a mixture of tequila with triple sec and lime juice to lessen de alcohol. Then she stirred the drink and it was put in rimmed salt cups. As you can imagine the drink was a success at the party and then it was unveiled to Mexico and the world. 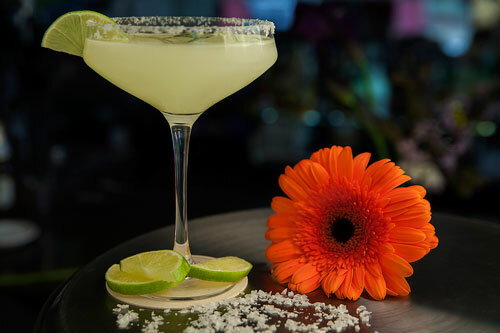 The margarita is one of those refreshing beverages that gives the sensation of being on holidays whenever is drunk. It combines marvelously tequila’s strong flavor with the sweetness of the orange coming from the triple sec and there can never be missed the lime’s acid point. The margarita is easy to make, you only have to prepare the cups and mix some ingredients. It is very important to prepare the margarita in a cocktail shaker so you get the best result. We recommend buying a quality triple sec so your drink has a better flavor, with a magnificent orange touch. The “Cointreau Triple Sec" is the best and the original triple sec. We also recommend using white, silver or platinum tequila. Pour in the 2 cups that were prepared the margarita, without adding the ice cubes. If you want to enjoy the margarita on the rocks, just add new ice cubes in the margarita. Tip: This margarita can be garnished by putting 1 lime slice on the cup rim. Variation: Gold margarita , a margarita with an aged taste.